On 1 December 2011 an amendment to Criminal law that prohibits sleeping in the streets of Hungary came into force. According to the amendment, if a person is found sleeping in a street, s/he must either pay 150.000 HUF or get 60 days of prison. 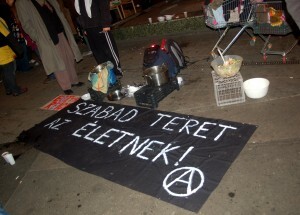 A group of activists decided to hold a solidarity night with homeless – a number of demos and actions in Budapest and in other cities on the evening and night of the 1st of December 2011. Around 10 places were occupied in Budapest on that night. 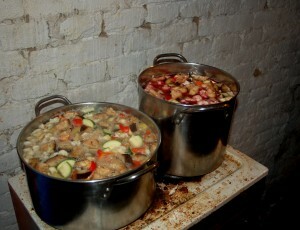 I thought that it would be a great idea to make a FreeShop and also cook for this occasion. 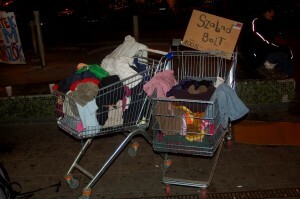 As usual, the FreeShop was full of clothes, so the only thing to be done was to bring it to the streets. As for cooking, we needed to get some vegetables to be able to cook, so I went dumpster diving to the markets on Wednesday. First, by pure chance I have looked into the trash bin of Spar supermarket in Móricz Zsigmond körtér. There I found some broccoli, lettuce and white reddish. Then I went to Fővám téri Vásárcsarnok – the central touristic market. Unfortunately, there was almost nothing to dumpster, as it was too late (around 5 p.m., 1 hour before closing time). So, I decided to go to Fehervari market hoping to find more stuff there. As I was checking dumpsters in this market (it closes at 6), the security asked me not to do so. 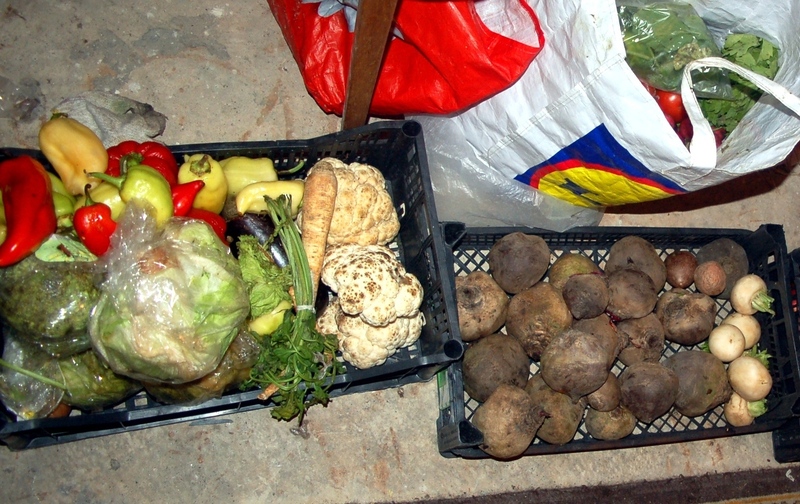 As my bag was quite empty, and we needed to cook for the next day, I went down to the ‘secret’ room with trash from the whole market. 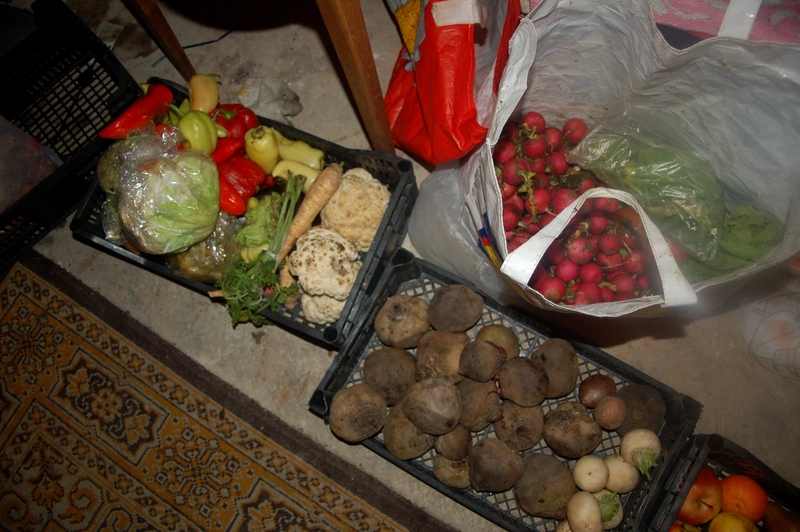 There was almost nobody, and a couple of workers that appeared there later, while I was diving into the huge trash bin fishing out beetroots and zucchini, were friendly and let me do the dumpster diving. So, at the end, there were several boxes full of fruit and vegetables both from Monday, November 28, and Wednesday, November 30. 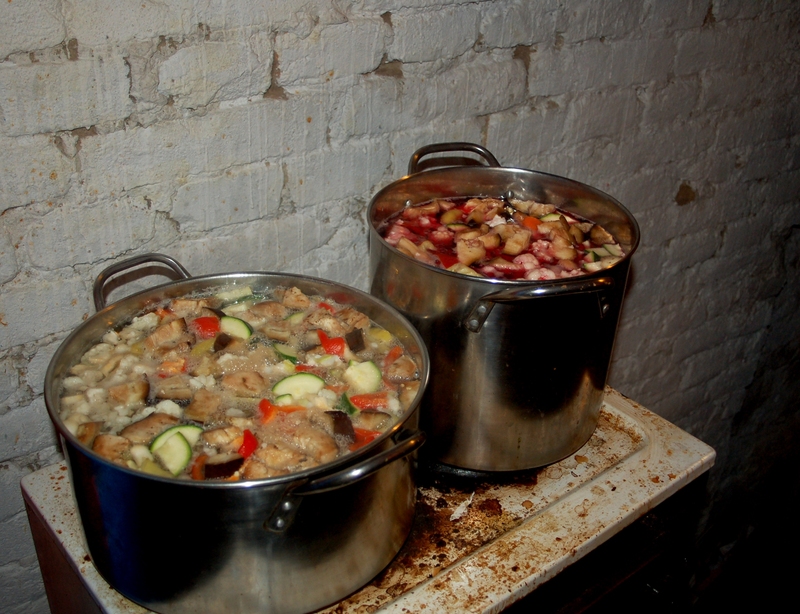 The evening of Wednesday and morning of Thursday were dedicated to cooking. 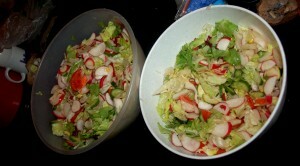 As a result, we had 2 bowls of salad and 2 pots of soup. Yum! All the stuff – the FreeShop and the food were brought to Blaha Lujza square and became an integral part of the whole happening there.